Dr. Oz is Giving Away 15,000 Prizes Worth Almost $1 Million TODAY! Starting at 12pm EST today, Dr. Oz will be giving away almost $1 million worth of prizes! WIN Dr. Oz’s Best Products to Cheat Aging! 12:00 p.m. EST/9:00 a.m. PST – Enter for your chance to WIN 1 of 1000 bottles of Eau de Lite. 12:00 p.m. EST/9:00 a.m. PST – Enter for your chance to WIN 1 of 700 Fitbit Ultra Wireless Activity Trackers. 12:00 p.m. EST/9:00 a.m. PST – Enter for your chance to WIn 1 of 200 Omega Vert VRT350 Juicers. 12:00 p.m. EST/9:00 a.m. PST – Enter for your chance to WIN 1 of 300 Clarisonic Opal Sonic Infusion Systems. 12:00 p.m. EST/9:00 a.m. PST – Enter for your chance to WIN 1 of 1000 Peter Thomas Roth Retinol Fusion AM Moisturizer SPF 30′s. 12:00 p.m. EST/9:00 a.m. PST – Enter for your chance to a WIN 1 of 400 Tanda Pearl Ionic Teeth Whitening Systems. WIN Dr. Oz’s Best Products to Fight Fatigue! 1:00 p.m. EST/10 a.m. PST – Enter for your chance to WIN 1 of 150 Keurig® Vue™ BreWINg Systems. 1:00 p.m. EST/10 a.m. PST – Enter for your chance to WIN 1 of 1000 vouchers for Flax Seed Parmesan Crisps. 1:00 p.m. EST/10 a.m. PST – Enter for your chance to WIN 1 of 1000 Navitas Cacao Goji Superfood Snacks. 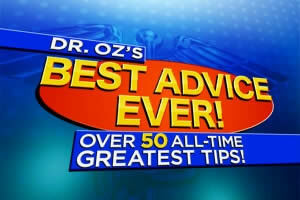 WIN Dr. Oz’s Favorite Alternative Remedies! 2:00 p.m. EST/11 a.m. PST – Enter for your chance to WIN 1 of 300 Himalayan Salt Inhaler kits! 2:00 p.m. EST/11 a.m. PST – Enter for your chance to WIN 1 of 1000 Revolutionary Healthy CFL light bulb 2-packs! 2:00 p.m. EST/11 a.m. PST – Enter for your chance to WIN 1 of 700 Spoonk acupressure mats! 2:00 p.m. EST/11 a.m. PST – Enter for your chance to WIN 1 of 1000 Neti Pulsators! WIN Dr. Oz’s Best Products to Help You Sleep! 3:00 p.m. EST/12:00 p.m. PST – Enter for your chance to WIN 1 of 1000 pairs of SleepPhones! 3:00 p.m. EST/12:00 p.m. PST – Enter for your chance to WIN 1 of 1000 Comfort Revolution Hydraluxe Gel Pillows! 3:00 p.m. EST/12:00 p.m. PST – Enter for your chance to WIN 1 of 1000 jars of NuttZo PF! WIN Dr. Oz’s Best Products to Fight Stress! 4:00 p.m. EST/1:00 p.m. PST – Enter for your chance to WIN 1 of 1000 Conair Touch ‘n Tone Massagers! 4:00 p.m. EST/1:00 p.m. PST – Enter for your chance to WIN 1 of 300 JumpSport Fitness Trampolines! 4:00 p.m. EST/1:00 p.m. PST – Enter for your chance to WIN 1 of 600 Mighty Leaf Tea Kits. 4:00 p.m. EST/1:00 p.m. PST – Enter for your chance to WIN 1 of 1000 RESCUE Remedy sprays. 4:00 p.m. EST/1:00 p.m. PST – Enter for your chance to WIN 1 of 70 Sony W-Series Digital Music Players.